7 Quick Takes: We’re on each other’s team. 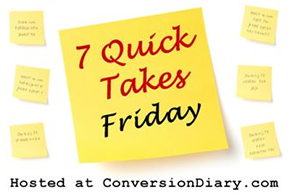 Join Jennifer and friends over at Conversion Diary for Seven Quick Takes Friday! Love your local librarian! Meet Sherrie from Sherrie’s Scriptorium. 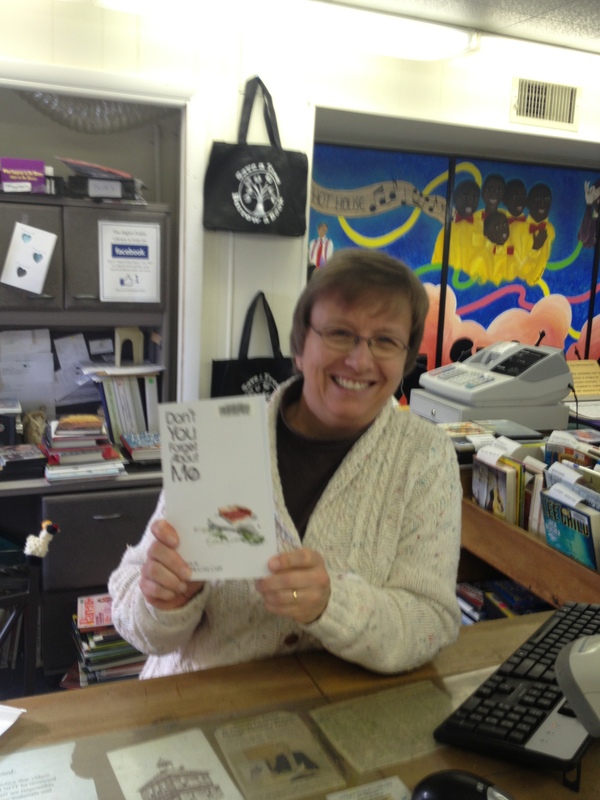 Sherrie is a writer, but she’s also one of the lovely faces we see at one of our local libraries. The picture above is of the day she pulled me out of a kids’ activity to show me that my book had arrived at their desk and she was putting on its library outfit. Friends, that is a cool moment, actually watching your book get put into circulation. I’m pausing here, because being arrested for “public solicitation” sure would have made an interesting impact on my career as a faith-based writer. …but there is still value to me as a writer because I get so energized when talking with other writers about how great it is to write.Thanks, Sherrie and Wordwrights, for welcoming me last night. 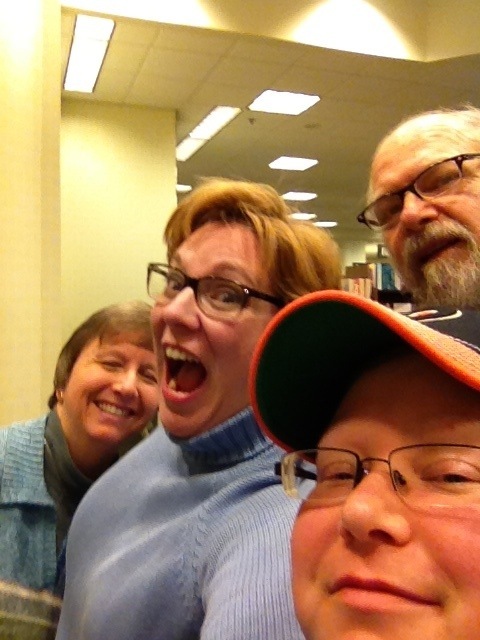 Besides hanging out with Sherrie, I met the other Wordwrights, including (but not limited to) Kelly (whose blog link isn’t coming up for some reason–sorry, Kelly! Comment with it and I’ll correct the link), Walt (um, same for your blog…), and Chris, author of Puppy Mill Dogs SPEAK! Pardon me while I go wipe my eyes after reading the description of Chris’s book–heartbreaking. I asked the attendees what sorts of things they read and write, and several folks were talking about an urban fantasy author whose work they adore. I should have written the name down (John something? ), but I was too busy mentioning Karina Fabian and her DragonEye, PI universe. Karina, I think Vern and Sister Grace may be getting a few fans in short order. After the conversation waded through my back-in-the-day, naive journey with an agent who asked me for a one year exclusive, Walt pointed me in the way of the Absolute Write Water Cooler, a series of forums for writers to pass along info regarding negative–or positive–experiences with agents, editors, and other writing professionals. Think Preditors & Editors but with a slightly more interactive feel. Thanks, Walt. We only have one week left in the month, and we haven’t had a Wildcard Wednesday Fiction Improv Linkup yet. When will it be? When will it be?